Maui has it all, from 42 miles of beaches to terrific coastlines, waterfalls, and a 10,000 foot volcano. 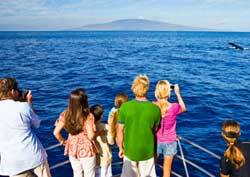 You came to Maui to see the island and our tours are the perfect way to do it! We recommend that you stay with us for a week, so you can enjoy all seven of our tours. We especially recommend our Tuesday Hana and our Saturday Haleakala Volcano tours. (You should arrive at least the night before to make sure you can sign-up in time.) 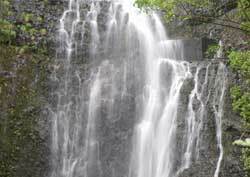 Commercial Maui tour operators such as Hike Maui and Maui Eco-Adventures charge from $50 for a short west Maui hike to $150 for a full-day Hana tour. 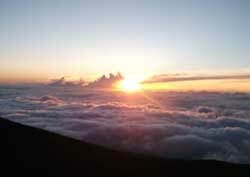 No tour operator does the full, 12-mile Haleakala crater hike that we do. So you can see, our free tours offer a tremendous value to the budget traveler, as well as opportunities to see sights, that commercial tour companies do not visit. Important: We do not take advance reservations for the tours. The only way to register for the tour is to sign-up once you have checked-in at the hostel. Sign-ups for each tour go up the day before the tour, only after that day’s tour has departed. If you are set on making a tour, we suggest you arrive a day in advance. Our tour guides are volunteers. A tip of $5-20 for the tours, which have a retail value of at least $50-$150, is appropriate and appreciated. The Banana Bungalow Maui takes you to Iao Valley State Park, where you will enjoy a beautiful rain forest hike in one of Hawaii’s most significant historical sites. 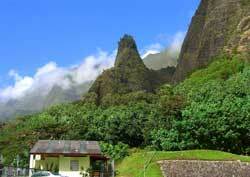 You will stop at Kepaniwai Cultural Park, and swim in the sacred Iao Valley Stream. Leaves at approximately 10:30 a.m., returns at about 2:30 p.m.
A day that you cannot miss! 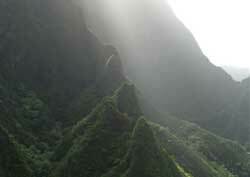 Be sure to be here by 8 a.m. on a Tuesday for this extraordinary Hana tour. We take you along the coast for miles of beautiful views and cross over 40 one-lane bridges, with waterfalls at every turn. You will see Wainapanapa State Park’s legendary caves, and visit a black sand beach. 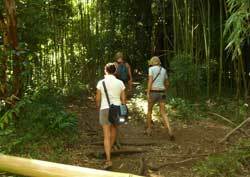 You will hike through a bamboo forest and cool off in waterfall fed pools. Leaves at around 8:30 a.m., and returns around 8:00 p.m.
On Wednesday, the hostel offers an all-day tour of west Maui. The tour drives along the western coast of Maui to the old whaling town of Lahaina, once the capital of the Kingdom of Hawaii. 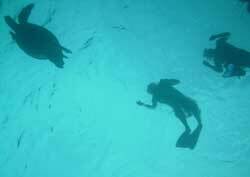 You will rent snorkeling gear, and head up to Kaanapali to visit the Whaling Museum and snorkel Black Rock. Then back to Lahaina for some free time to tour the shops, art galleries, restaurants and historical sites, including Buddhist shrines. Leaves at around 12:00 p.m., and returns around 8:00 p.m. *Price of snorkel gear rental not included. On Thursday, the Banana Bungalow Maui hostel takes you snorkeling at our favorite secret spot by the Maui Prince hotel beach. 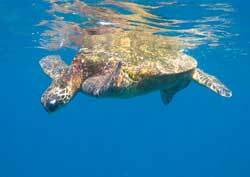 We also snorkel the famous “turtle town” where you can swim among a large group of sea turtles. 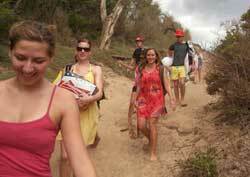 You will spend some leisure time on Makena beach. The last stop will be in the town of Kihei at a local handcraft market. 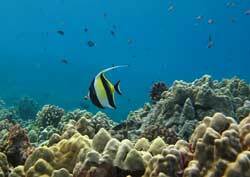 Leaves at around 10:30 a.m., and returns around 7:00 p.m. *Price of snorkel gear rental not included. The tour stops to rent gear on the way. December to April (approx. ), our Friday tour is an afternoon sail to watch the largest Pacific pod of humpback whales. 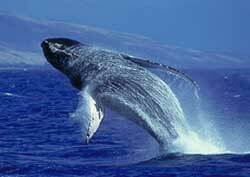 Thousands of whales travel from Alaska to winter here in the warm waters of the Maui channel. While here, the whales will breed and give birth. A whale sighting is guaranteed! 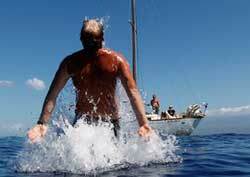 *The tour does not include the cost of the boating excursion with the Pacific Whale Foundation aboard the 12:30 sailing of the Odyssey, approx. $36.00 per person. April to December (approx. 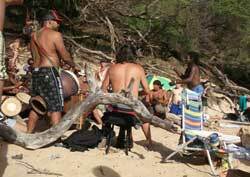 ), we take you to Paia Town. Paia is a historic sugar cane and north shore surf town, full of unique shops, good food, and a great beach! 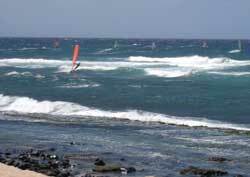 Enjoy Maui’s beautiful north shore. Leaves at about 10:30 a.m. and returns around 5:30. 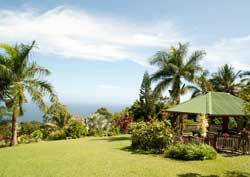 Be sure that your stay includes a Saturday, because that is when the Banana Bungalow Maui hostel offers an all-day tour to Maui’s Haleakala Volcano. Haleakala, at just over 10,000 feet high, is above the clouds. We leave in the morning for the incredible drive up Haleakala. Experience a stunning array of climate zones as you pass through pasture land, exotic flower farms, and fragrant pine trees to reach a summit covered with lava. 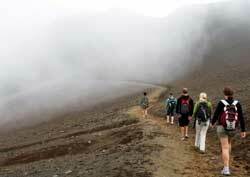 Then the magic begins, a 12-mile hike through the largest dormant volcano in the world. The landscape is like you are on another planet. Bring warm clothes and rain gear! It is 30 degrees cooler at the summit than at sea level. After the hike we watch the sunset above the clouds, and head home to our jacuzzi to soothe those aching muscles! Leaves at about 8:30 a.m., returns at about 8:30 p.m. Children under 10 not allowed. *Guests must pay National Park Entry Fee. On Sunday, guests of the Banana Bungalow Maui hostel take a day off from hiking and adventure to relax at Makena’s Big Beach and Little Beach. These beaches in southwest Maui are among the most beautiful in the Hawaiian islands. Big Beach is a large, white sand beach with some interesting body surfing. Do be careful of the surf! Little Beach is hidden on the other side of a lava outcropping, and is clothing optional. There are usually people playing music and dancing. The beach day ends with Maui’s biggest sunset jam, right on the beach. 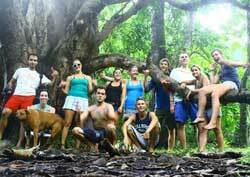 Leaves at around 1:00 p.m., returns at about 8:00 p.m.
Tour Rules: You must be a guest of our hostel to participate. Paying guests the night of the tour have priority. 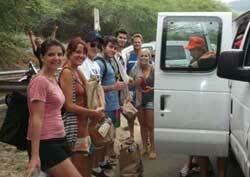 We have two 15-passenger vans, for a maximum of 28 guests. Due to National Park regulations, Tuesdays and Saturdays are limited to 22 guests. We can not guarantee that everyone will be able to participate in our tours. There is a minimum passenger requirement per van. You may not sign-up for the tours before you check-in to the hostel. Sign-up for each tour is available ONLY one-day in advance once that day’s tour leaves, and ONLY in the hostel lobby. You must be physically here to sign up for the tour. Management reserves the right to cancel any tour in the case of hazardous weather conditions. Our tour guides are volunteer work-exchange guides. If you have a good time, a tip of $5 – $20 is appropriate.